Pet parents spend billions every year on pet food. Why let any of it go stale? When we purchase pet food, we want it to be as fresh, safe and healthy for our pets as possible. One of the ways to help ensure our pet food is safe and fresh is storing the food properly when we get it home. Keep all of your pet food and treats in a secure location away from your pets. Pantries and laundry rooms are great places for storing foods, as long as the rooms are temperate. Your food should be stored at room temperature in a place where it does not reach above 80 degrees. Heat and moisture may cause your food to degrade. Always keep your kibble and treats in their original packaging. This allows you to have important information handy, such as expiration dates, bar codes and lot numbers, should you need them. If your pet food doesn't come in a re-sealable bag, you can use large clips to close the bag. If you want to use another container, use a storage container with a tight seal. The FDA recommends keeping your kibble in its original packaging and placing the bag in the other container. Your container should be airtight and have a tight seal and stored at room temperature. If you want to pour the kibble directly in your storage container, keep a journal handy with the expiration date, lot number and bar code. Or, you could tape this information to the container if you remember to update it with each new bag. Before adding another bag of kibble, remember to thoroughly wash and dry the container when it is empty. Put leftover wet food in the refrigerator. Your wet food contains meat and other products that will spoil, so it's important you put all uneaten food in the refrigerator for safe keeping (you can safely bring it back to room temperature to make it more appealing the second time around). When storing in the refrigerator, put the food in a new container with a tight seal. Glass containers work very well. This helps the food retain its flavor rather than picking up any undesirable flavors from the refrigerator, original can or packaging. 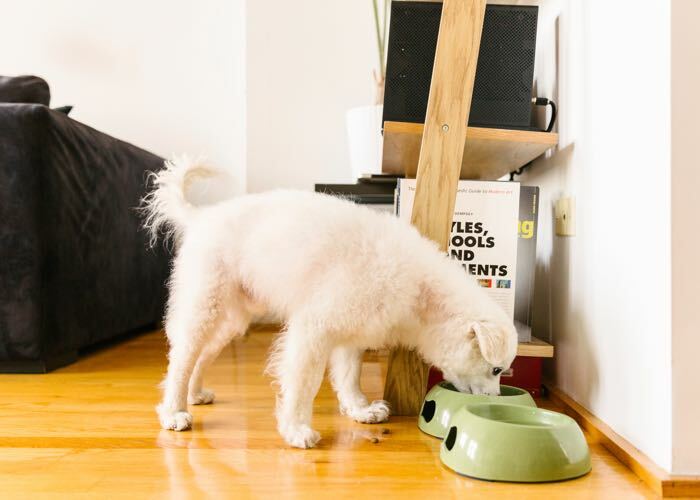 Remember to always wash your pet's food bowls and scooping utensils after each use and wash their water dishes daily. If you follow these simple rules, your pet food should remain fresh and safe and your pets will remain happy and healthy. Do you have a unique or fun storage container in which you store you pet food? Tell us about it and post photos in the comments. Photo Credit #1: "Cat food" by Joshua Powers via Flickr. License info.